Sweden is expected to continue to recover strongly from the recession as high saving, low interest rates and an improving jobs market encourage consumers to step up spending, according to the OECD’s latest Economic Survey of the country. Investment is set to expand on the back of export growth and consumer price inflation is expected to be subdued as wage pressures remain moderate. But as a small open market economy, Sweden is still exposed to conditions in external markets. The OECD says Sweden’s relatively low public debt and sizeable budget surplus helped the authorities tackle the crisis without storing up long-term problems for government finances. Looking ahead, stimulus measures and support to the financial system need to be scaled back as economic recovery unfolds. Swedish service production increased by 5.8 percent in volume and working day adjusted figures in November 2010 compared to November 2009. Service production for January to November increased by 4.1 percent in volume and working day adjusted figures compared to the same period in 2009. The last few days of the year look to be very cold throughout Sweden, according to a forecast by the Swedish meteorological agency SMHI. This means that several parts of Sweden, including the southern region Götaland and eastern Svealand, will have experienced the coldest December in at least 110 years. In the taxation year 2010 for income during 2009, taxable income for physical persons, mainly private persons, increased by SEK 21 billion or 1.3 percent to SEK 1 623 billion. At the same time, taxes and fees decreased by SEK 23 billion or 4.1 percent to SEK 545 billion. There were two main reasons for the decrease in taxes and fees. First of all, the in-work tax credit, i.e. a tax deduction for income from work, increased by SEK 12 billion to SEK 65 billion. Secondly, a new tax credit for home renovations and household services was introduced, amounting to SEK 10 billion. The following table shows debited amounts at the time of the latest assessment. “Slippery conditions will continue across the country. 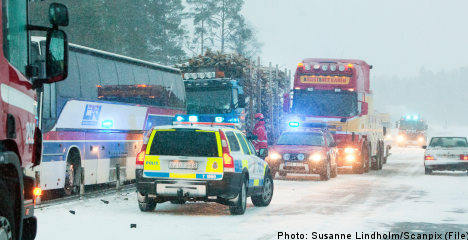 There is already a lot of snow on the roads,” SMHI’s Elin Torstensson told the TT news agency. She explained that Sweden has experienced more cold days and more snow than is normal for December. The new reform to speed up the introduction of newly arrived immigrants into working and social life enters into force on 1 December 2010. This is the greatest change in integration policy in decades. A quicker introduction will be made possible by strengthening the personal incentives to both take up work and take an active part in employment preparatory activities for becoming jobready. A clearer and more distinct division of responsibilities between different stakeholders will create an effective introduction chain. Individual introduction plans will be drawn up to make better use of the skills of newly arrived immigrants.